Should WCA provide rankings and records separately? Most sports clearly distinguish rankings from records. For example. tennis, badminton ,etc. As the sport grows older, the records become tougher to break and it does make sense to have a separate ranking system which represents who are the best in the sport currently rather than who has been the best in the entire history of the sport. Currently if competition winning averages are usually WR 200-300 level. 10 years down the lane it is possible that the usual winning averages are ranked much lower in the world rankings as the sport spreads more widely. What do other people think, should there be two separate statistics available for competitors? How the rankings will be evaluated can be discussed later and I request members to not get there. But does the community feel having this would be a good measure or bad measure? Please provide arguments(if any) as it would help in a good discussion. I think an up-to-date ranking idea is an excellent idea. However, I think that currently it is not so necessary, records are still being broken all the time. I'm not entirely sure if comparing it to tennis and badminton is such a good idea, since tournaments are knockout, certain sets of tournaments are given certain values, and having a ranking system is relatively easy as a result. I think comparing it to something like athletics or swimming would make sense, since tournaments and events are run in quite a similar way, with heats, semis and finals (As we have combined rounds, and such). The problem arises with coming up with a good system. But for those who want to theorycraft a system that works, remember, no system is ever perfect, so don't worry about "arbitrary" numbers or anything for now, it's still early doors. The most important thing for now is the idea behind it, and not the numbers. Who cares about individual competitions? The winning averages just depend on who shows up, since there's so much variance that you can certainly not expect e.g. a sub10 average. So if a competition gets won by an average that is way down the "best ever" list, it's no problem. It just means there are many people who could have theoretically shown up and won. If you are worried about the fact that eventually many of the best people will be retired, you can just look at the times from the past year or so instead of the all-time record list. Rankings in tennis, badminton, chess, etc. are there because those games are based on matching up players - your skill can't be measured absolutely, since your play style and whether you win depend on who you are up against. That kind of ranking is required to determine how good people are - who you play against is very relevant, so the kind of absolute ranking we have is basically impossible. But cubing is a sport where your performance is given by a number: your time (or movecount, or number of multibld points, or whatever). Everyone performs individually and the winner is just who got the objectively best performance. So the kind of ranking that we have works really well, whereas a ranking like tennis or chess would make very little sense. what about golf? 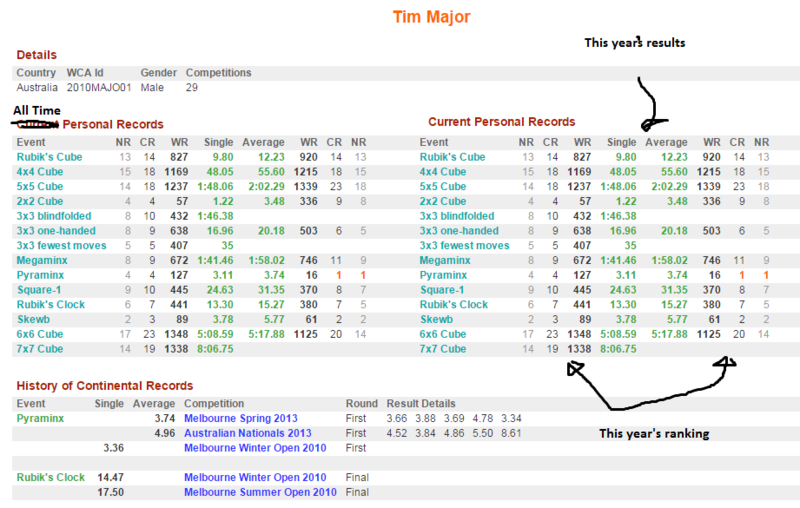 same type of individual sport as cubing but there are rankings. Exactly, I agree tennis and badminton were bad choices, i just wrote off the top of my head. Of course I do not propose to remove records. But with time, over a time span , rankings get more important than records. There are some individual sports which are not dependent on the opponent which are ranked and i think it makes sense to rank our sport too. well then again, golf is the only individual sport i can think of that has non-record type ranking. swimming, running, jumping, etc. are all record base as far as i know. Can't tell if you're trolling... he clearly means something different to what we already have (I was at first confused, but then realised it's an unfortunate choice of ambiguous terminology). Personally I think it's a good idea. Rankings could be based on times achieved by a competitor in recent competitions (in recent years), and compared to every other competitor in some way. It could definitely work, and it would definitely be a much better indication of who is currently leading the world in achieving consistently top-level times. I agree with this wholeheartedly. I'm not exactly sure what the number should be, but there should be one page with all time ranking (the ranking page as we have it now), and another with current rankings, where only people who have competed in X competitions in the last Y months are included. This of course could be 1 competition in 60 months, or as restrictive as 3 in 12 months, but I think it would give a better picture of who are currently the best people at speedsolving. Why would we need another (arbitary ) ranking if we already have absolute ranking in wca website? Instead of refreshing it every year, maybe have a rolling year (or period of time, however long is deemed appropriate) for the current "ranking WR". Yeah, just pointing out that these terms are already well-established in cubing and that he's misusing them and that it's confusing. well then again, golf is the only individual sport i can think of that has non-record type ranking. I think it would be nice to have the best single and average for every given year, as this might be more feasable to attain for many as world records get faster and faster and more based on luck. For example, the 2x2 WR probably won't be broken for some time, so a yearly record provides a better goal. Yes, it exists, but making it more prominent (ie. showing it on the records page) would be nice. How would it be more prominent on the records page? Also, your argument was that the given year's best is more feasible to attain for many. So shouldn't you *prefer* it as a ranking showing more than just the very best, as beating the very best is not feasible for many, and getting into the top 100 is more feasible to attain for many? The link below might provide some food for thought. It's another sport all about improving PBs and national / global rankings. Without having a login you have limited ability to view the various types of ranking on the website but I'm sure you get the idea. It's nice that everyone (not just top 100 / 1000) can see their rankings, whether it be all time or the current year. Come the start of the year it's also nice to get your name up on the front page (temporarily) as one of the year's top 10. Personally I always find the current terms confusing, even after all these years. I often choose the wrong one when I want to look at something. The way the WCA database uses the term "rankings" is more like "best result (for each individual)" But that's besides the point... more importantly, what other term might the OP use to describe what he is trying to achieve? After all, I reckon most sports would use "rankings" to describe a points-based system to determine who is currently the best. Also that previous thread is somewhat different from what is proposed here (at least the way I interpret the threads). Anyway, I think having an up-to-date ranking system would be awesome. It would be super helpful to show which cubers are coming into the elite, which are falling behind or leaving the sport, etc. If you're suggesting that we keep all of the rankings as an "all time ranks" sort of thing but also have a yearly ranking of the events, then I completely agree with you. Otherwise, when records and high ranks start getting almost unbeatable, people will start wanting to throw away the event. Maybe they shouldn't change it yet though, maybe when records aren't getting beaten as much as they are at the moment.